Six On The Brimm, under jockey Uriel Cervantes, winning the $16,4450 Great Lakes QH Association Futurity at Indiana Grand Race Course. SHELBYVILLE, IN—NOVMEBER 1, 2018—Under a hand ride by jockey Uriel Cervantes, Six On The Brimm defeated Cause For Corona by 1-½ lengths on Tuesday (Oct. 30) in the $16,4450 Great Lakes QH Association Futurity at Indiana Grand Race Course. Dianetobeadiva finished half-a-length back in third. Conditioned by trainer Tim Eggleston, Six On The Brimm completed the 350 yards in :18.209 seconds into an 18 mph headwind to take home the winners' check valued at $5,758. An Indiana home-bred, racing for owner/breeder Mary Dandrow, Six On The Brimm has won his last two starts to bank $17,182. The sorrel son of Tough To Get Six is out of the Brimmerton mare Brimms Fair Tale. 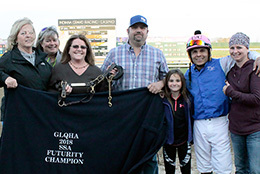 The winning connections of Six On The Brimm accept the Great Lakes QH Association Futurity stakes trophy Tuesday at Indiana Grand Race Course. Runner-up Cause For Corona picked up $2,797 for his second-place effort. 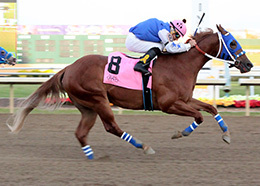 Also trained by Eggleston, the daughter of Cartels Feature was ridden by jockey Giovani Vazquez-Gomez. Darrel Henry bred the buckskin filly from the Dashing Val mare Valorie Cause. Placed in three of six starts this season, Cause For Corona has earned $10,357. Eggleston got the tri-fecta when Dianetobeadiva, under jockey Natasha Fritz, got up for third. A homebred daughter of Cartels Feature, Dianetobeadiva races for owner/breeder Patrick Easter. Out of Dianes Easter, by Dashing Val, she earned $1,974 for the effort. Our Little Eagle, Scan Here, Country Blue Chic and Step It Up Jack completed the field.